A shanty town of junker street urchins that watch out for their own. The perfect place to find jury-rigged tech but watch your wallet and your back when dealing with these ‘kids’. Link. As I ran my Savage Worlds Dark Sun game for a while, I really wanted to flesh out the world some. I opted to tinker with a lot of stuff including the notion of days, weeks, and months in a year. So I ended up changing quite a bit to fit what I wanted Athas to be. One particular idea I enjoyed was that metal was rare and ceramic coins were used exclusively in city states. However if anyone follows my blog, they’ll realize I dumped keeping track of coins and stuck with abstract tallies of wealth being shares of treasure instead. It’s worked well for me, but I still needed some general yardstick of the value of currency for players. If they found a haul of coins, how much would hirelings cost? If they needed to hire caravan guards or craftsmen to build something, what would be a fair price? So I decided to whip up some background information on typical wages in Athas. Wages in Athas are loosely based on the piece standard (or silver standard for free folk outside the city states). For a 10 day week’s labor, a wage of one piece or one silver is earned. Most of that wage will go towards housing, meals, and water, allowing a laborer to have 2 or 3 bits (2-3 copper) pocket money for additional goods. While not earning a wage, slaves also would cost their owners approximately one piece per week. Free citizens and craftsmen earn 2 to 10 pieces a week. Even though most laborers have wages twice that of a lowly slave, they still need to live somewhat frugally. Nonetheless they can eventually acquire some extra pieces each month, allowing for some luxuries. Most bodyguards and thugs will also take a wage of 5 pieces a week, while professional soldiers commonly get wages of 8 to 10 pieces per week. Although it might be expected these are low wages for such dangerous work, life is brutal and hard in Athas. Most able bodied warriors are willing to take a low wage if it avoids the alternative of toiling away as a day laborer (or even worse as a slave). The more upper echelons of society ‘earn’ wages of 20 to 50 pieces weekly. This varies from wealthier merchants and low ranking nobles, up to more powerful merchant house leaders and highborn nobles. At this income, it is expected that even the most modest noble houses will have have at least 2 to 3 servants. However, commonly most of the upper society requires an income of roughly 15 pieces a week to keep up with household expenses. While they live quite comfortably, they likely do not have an exceedingly opulent lifestyle. The truly extravagant nobles would spend three to four times that amount weekly and be typical of a great lord or high ranking Templar. Although Athas generally accepts a wage of one piece per week, this is commonly used as a yardstick for determining a fair wage for free citizens. Labor is cheap in Athas and most foremen will strive a hard bargain for that uncommon laborer being paid wages. Instead they will be offered 7 to 8 bits a week, as much as it would cost to have a slave to do the work instead. In Tyr, this disparity in views on what is a fair wage has been coming to a head. As Tyr has thrown off the mantle of slavery, many of the newly freed citizens are calling for a two piece wage. This 2 pieces movement is exceedingly popular among the poor and low status populace. They feel this is a wage enjoyed by free citizens in the past and should be applied to all. Many trade leaders and crafts guild leaders are countering with making one piece a true wage standard in Tyr, ensuring that all laborers and unskilled workers get this wage each week. The more shrewd merchants and nobles hope that this is popular enough among the third of Athas laborers now getting 7 or 8 bits per week, that they will agree with this compromise. Currently the 2 piece movement leaders and various head merchants and nobles are in fierce negotiations on what the wage standard in Tyr should be. Eventually, the rebellion King Tithian will have to make some official decree on the matter. I’ve got a player eager to take the helm running a D&D game periodically. I’m super excited to see them flip to the other side of the screen and be a DM. They freely admitted struggling some with thinking up an appropriate way to kick off the game, and the decision to dabble in making up their own world or run something pre-made. They also wanted to know if I had any advice. So I pointed them over to Running the Game, a YouTube series about being a DM. It’s done by Matthew Colville, a writer that also works in the video game industry. The videos he creates run between 15 to 30 minutes and commonly cover a specific RPG topic. Some address a specific issue most DMs will face at the table or when planning out their session. He also has a series that covers his own game more in detail and the problems he occasionally has when playing. Now a big caveat with the advice is that what he will regularly state the tidbits he throws out are his opinions and how he likes to run his own games. Your mileage might vary with his advice, and he’ll freely admit his approach might not be for everyone. Another point is that much of the series is about running D&D. I think if you were a GM for other game systems a lot of his advice would still be great but you are going to get some chunks of content not quite applicable to a non-D&D game. This last point touches on a few episodes. One is related to the Deck of Many things (which dragged some for me), and if not playing D&D or including that magic item in your campaign, much of the video will be not helpful. However you might pick up some interesting tips and ideas handling a similar powerful, legendary magical item in your own game. The concept of using a few props to spice up your game is great and I particularly like the idea of a little sleight of hand to make players think they have full agency (when in reality you are guiding events some). Another ding with the video series is the speed that Matthew speaks. He talks fast. You might want to slow down the playback speed at little. I think especially if English wasn’t your mother tongue you’d have a hard time keeping up. I enjoy his rapid fire dialog and find it engaging and quippish, but keep in mind he speaks at a fair clip. But these are quibbles. You’ll find his videos a great resource. I especially like that he also talks about things that fall flat at his table. We tend to just spout off the things that work in our sessions and not dwell on the times when things just didn’t work. I agree with his opinion that sharing stuff that failed can also serve as helpful advice. In the end you have a fantastic introduction to being a DM. Seriously, for the uninitiated wanting to sit down and try their hand at running a game, this is a great series. 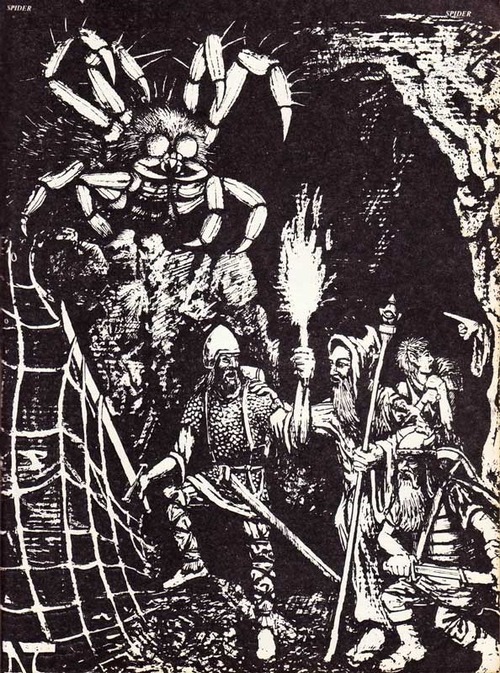 The first four are especially solid tutorials for DMing your initial adventure. There really are some golden tips covered in them. It’s such a helpful and entertaining bunch of tutorials. I really can’t recommend it enough to new DMs, and if you’re a bit long in the tooth as a GM, give a few videos a watch. You’ll either be nodding your head in agreement or picking up a few good ideas for your own game. For a long time I had Expeditions of Amazing Adventure going which was a series of posts on some manner of a location or culture that could serve as a springboard for an adventure. Primarily my inspiration was a picture and I’d whip up some fantasy locale and occasionally throw in some adventure hooks. It was all very general and my original focus was for 4E D&D. That series grew and eventually I had a ton of posts. So much so I compiled them into their own section. But it sort of lingered in my brain to do something more with it. I rolled around the idea of maybe compiling them together in a campaign setting. For my 4E game I ended up making my own setting thrown onto a map from Warhammer. Mixing in the points of light setting along with tweaks I made (using the map as fodder for names), I ended up with Terrene. For well over a year, it was home to my players for our 4E campaign. Few new rules and edges – There are a smattering of new things in the setting. I pretty much wanted to keep it a vanilla setting easily sticking with the SWD and Fantasy Companion books. I have a new race, a new humanoid monster type, and sprinkled in a default skill choice for all of the races. Portal gates – One quick means of getting around would be through portal gates that allowed instantaneous transportation, but at the same time it is unreliable. Maybe players will land at their intended destination, or maybe not. I think this helps facilitate grand adventures. If the players want to take off to the frigid north or steaming jungles, they have the means to do so and not get mired down in spending weeks or months on the road. However the travel comes at a cost. Maybe you’ll end up where you want and maybe you’ll end up stuck deep underground in the middle of some lost city. I dig that and it can make for some fun adventures. The portal gates open doors for adventure, not close them off. No one major power – The Empire exists but there are lots of other kingdoms. The Empire is not necessarily a force of good either. Many leaders, nobles, and lords have selfish interests. This allows for players to be heroes in the world, or be able to serve as mercenaries to the highest bidder if they wish. There is also some room to play off other powers, be in wars, or take part in espionage if players want. Competing regions means there’s some room for players to have some fun working for different kingdoms, or potentially carve out their own fiefdom. Long history and fallen cultures – The Pomdarians that are somewhat of a mystery. They are this ancient race of lizard folk that had an immense empire and then overnight they disappeared. What happened to them? There was the entire continent of Alondarra that sank to the bottom of the ocean. What became of them? Over thousands of years many races reached epochs and declined, leaving a wake of ruins and treasure to be found. That makes for some interesting stuff to base adventures on. So you can find Terrene and a basic map in the downloads section. Admittedly a lot of the the location names are awful. I hobbled myself originally sticking with some goofy alliteration for the expedition posts, but they are serviceable (and certain folks will be changing them). However I hope folks find some useful stuff here for their games. So my sci-fi Savage Worlds game is chugging along. Generally it’s a big sandbox game. The players are flying around in the Scalawag and seeing what trouble they can get into. I employ a sci-fi version of a job board. Each system they jump into they have a few options on employment opportunities. For my game I scooped up the idea of Traveller’s FTL travel. You jump so many parsecs and it takes about a week in this alternate space, regardless of the actual distance traveled. In effect is this age of sail feel for the game, allowing players to potentially run from the law or bounty hunters (and making pursuits after baddies all that more aggravating). I also fell in love with an idea from Traveller Patrons books. Essentially when the PCs get a patron, after making the initial meet and accepting a job, the GM rolls a d6. While the typical results mean that opposition or the expected situation is what the patron described, there is a chance things could be far more difficult, or that the entire situation is not what it initially seems. I loved this concept as I’m certain I tend to telegraph any secret intentions from NPCs. Not to mention this sort of mirrors events in real life. Sometimes things are a lot easier than expected and sometimes well… sh%t happens and everything goes pear shaped. Players must [Do][Something] at [Location] against [Opposition]. So I have a series of tables for the Do, Opposition, Something, etc. As a twist, sometimes the players might have to go through some hoops to complete an adventure. Success or failure from previous adventures might impact future tasks, so I created another chart to mimic that. This would also potentially throw in complications to the adventure. To add some structure, certain types of adventures would utilize particular types of side missions, and additional charts I whipped up reflect that. The end result you can find in my downloads section. This adventure generator isn’t perfect and sometimes you get some wacky combinations that need to be reworked some. However I’ve been surprised how flexible it is. It really has become a great way to spark adventure ideas and a helpful tool for creating a foundation for a potential mission. Hope folks find some use for it in their games. Quite a while back I talked about some of the fan made settings I liked. One was a great classic space opera ruleset called, Savage Space. There were some really cool ideas in that one, and I latched onto it and used Savage Space to port over to a some other conversions I whipped up. Savage Worlds doesn’t get saddled down with a lot of different skills. However occasionally you get a few that sort of overlap, or mushroom into a ton of different options that just don’t really amount to much practical differentiation in actual play. The Investigation and Streetwise skill come to mind. Yes there is a difference in how the skills are applied and how they are supposed to work in specific situations. However I can see some players making an argument that either could be applicable to particular challenges. One that certainly stood out to me was the swimming and climbing skills. A ways back I was working on a Traveller hack using Savage Worlds and ran into this skill problem with swimming and climbing. Traveller uses Athletics as a catch all skill for tests of physical activity. You were never penalized for not having it, and could always test against strength, dexterity, or endurance if needed. But a good way to show you had all round physical prowess were skill levels in Athletics. While digging through Savage Space, I saw the writer picked up on the same vibe. Climbing and swimming were not skills in that setting. Instead a uniform skill called Athletics was used. I loved it. As RAW, if most characters wanted some decent representation of physical ability they would need to spend 4 points, both to raise swimming and climbing to d6. That is a chunk of points and nearly a third taken up for something that would likely be used in limited situations. There should be other (and better) options. Points used to raise this skill are either based on Agility or Strength, whichever die type is higher for the wild card. This skill replaces Climbing and Swimming from the Savage Worlds rule book. This skill is also applicable for tests of physical ability. It represents the overall fitness of the character and how well they might complete some physical tasks. If a character was a professional athlete they would likely have at least a d8 for this skill. A long time back I was running a weird west game that was a lot of fun. I dig Deadlands but wanted to work on my own setting, an alternate history of sorts that dabbled in the supernatural. There were zombies and werewolves out west, just not quite dominating the setting like what you’d see in Deadlands. 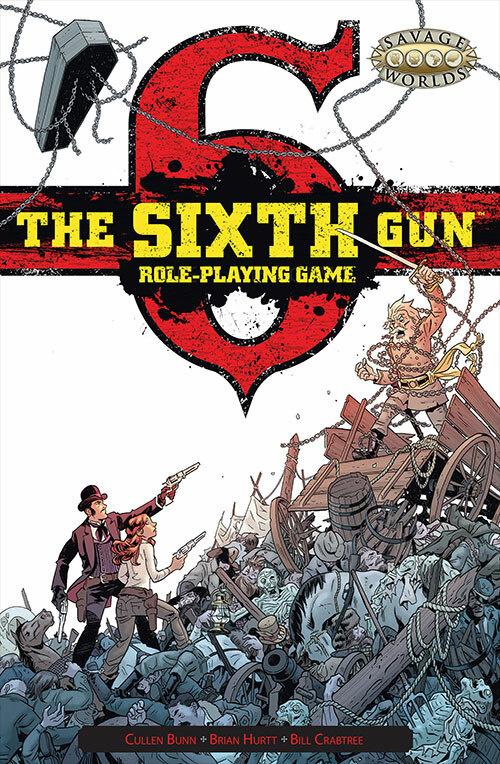 I latched onto the 6th Gun comic as a theme and think it’s fitting that it got scooped up officially for a Savage Worlds treatment. Deadlands is solid, but there is so much material out there, it might be a little overwhelming trying to get into the world. The 6th Gun setting just seems to be an easier launching pad for a campaign and something a bit more ‘grounded’ of a setting. The setting book takes that spirit to heart. There is a smattering of edges and hindrances. 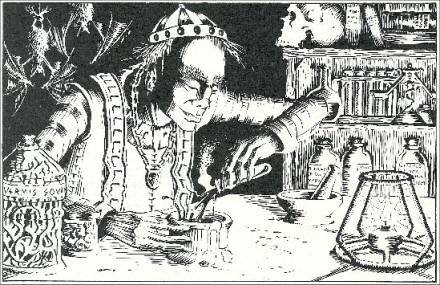 As rules go it highlights a few magical systems as either shamanism, sorcery, or voodoo with a few additional spell powers. There aren’t full fledged archetypes, rather a nice selection of character themes for players to mine for ideas. You do get a pretty comprehensive list of equipment, gear, and weapons. Along with this is a small section of magical artifacts, a bestiary, and a roster of NPCs which are in both flavors of villains or allies. Mind you the allies might be a loose term for some of them, and might offer more complications than assistance to the players. The book provides a brief description of some key locations, along with the town of Brimstone. Brimstone is a locale that offers a good start to a longer campaign. There are a lot of fleshed out town locations along with suggested adventure seeds and thumbnail sketches of key NPCs. It gives a good staging area for GMs that are looking to quickly get a game running. Being a western setting with a bit of a supernatural twist means that it’s not saddled down with too much world information. 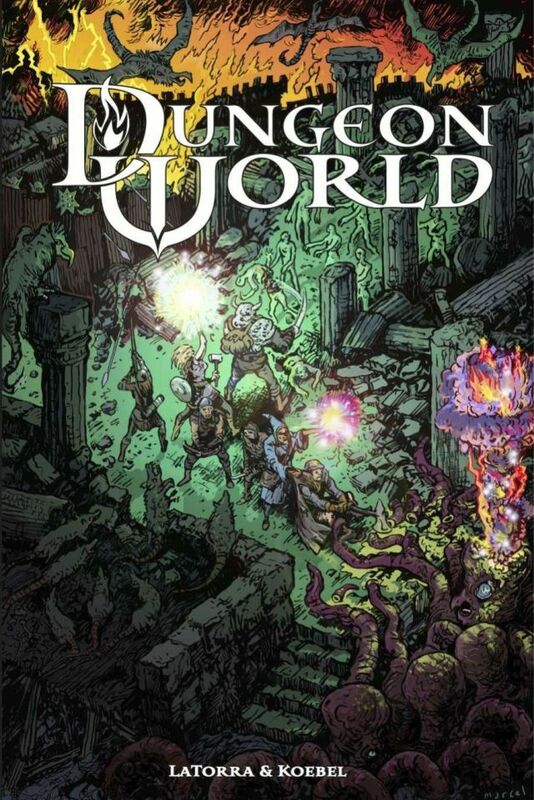 There is a brief background of the campaign setting which revolves mainly around the presence of six magical pistols that grant the wielders powers. True to the setting name, each of the 6 guns and their effects are provided in detail. There is an involved synopsis of the comic series at the beginning of the book. This provides a fair look into the world of the 6th gun. It might not give the most coherent means of a campaign background but it does provide a GM with a bunch of ideas on the types of adventures players would likely have in the setting, especially if the 6 guns are part of the main plot. 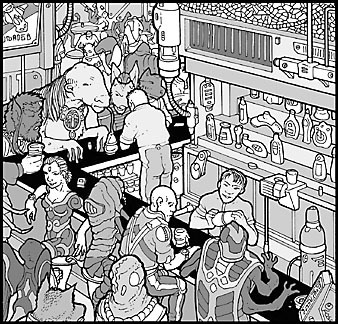 Another plus is that it provides some more insight to how particular NPC characters might act (if lifted from the comic series as inspiration). A decent adventure generator is included in the book. Along with this are five more detailed adventure offerings. They are presented as a series of encounters and trials for players to tackle along with brief descriptions of NPCs, villains, and locations. As new rules go there are fortunately very few. They all seem to embrace pushing the game into epic tales of adventure quickly. Players can freely pick edges and aren’t limited to ones based on the current level of character advancement. Critical failures can’t be rerolled by spending a benny, giving the GM opportunities to really muck up a situation. Lastly whenever a Joker is drawn, all players get a bennie. This allows for even more boons of fortune and encourages players to take risks. The Good – The setting offers a framework for running a supernatural western that matches well with the deluxe rules. There is a fair amount of creatures, NPCs, magical items, and lists of gear and weapons to allow a GM to run a game. The material is presented well and the layout and art of the book promotes the spooky western theme nicely (much of it taken from the excellent comic series). The Bad – The setting is a bit light on background. 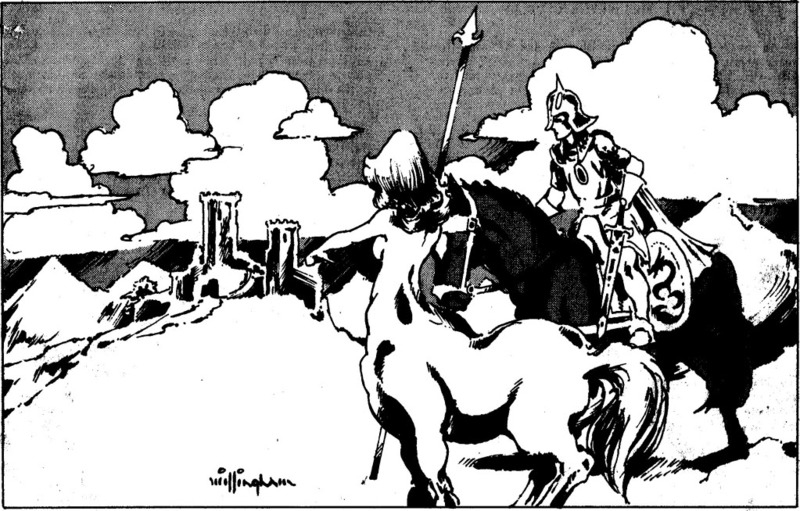 While westerns are staples of adventures, the supernatural setting might offer some difficulty getting the right tone. The setting obviously can center around obtaining the 6 guns, but there really isn’t a structured plot point campaign to cover that. In that sense the book seems more a toolset than a fully fleshed out campaign setting. Rewarding the 6 guns might also be an issue. Not all of them are equal in power and as they can have such a central role to the setting, giving players one (or some) might ramp up the power curve of the game too much. 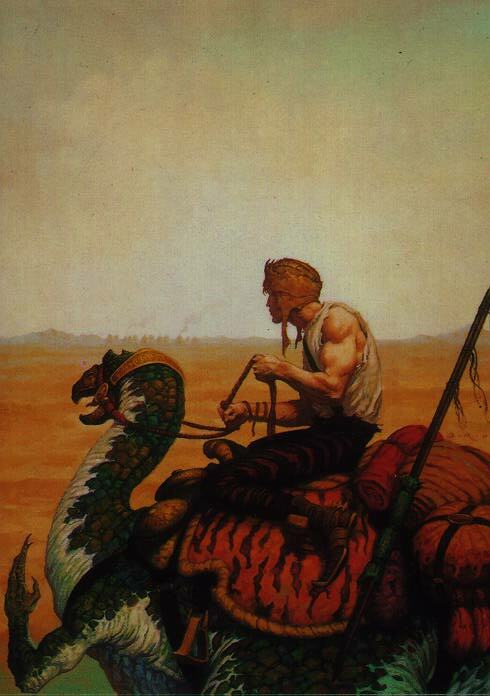 The Verdict – The 6th Gun campaign setting isn’t a bad book. I certainly feel that if you were looking for a western with an occult twist, this is a better choice over Deadlands. Fortunately the setting isn’t encumbered with tons of new rules and options for players. I think what best sums it up is that overall the book provides tools for running a supernatural western. A GM has the option to delve into the mythology of the 6 guns deeply, or keep them peripheral to the game. At first glance the setting has a lot more going for it to provide for one shot or shorter campaign games. Long, epic campaigns might need more work, especially if seeking out the 6 guns won’t be a key part of the story. Regardless, if wanting a western that’s slightly off kilter with ghosts and supernatural creatures, the 6th Gun setting delivers. 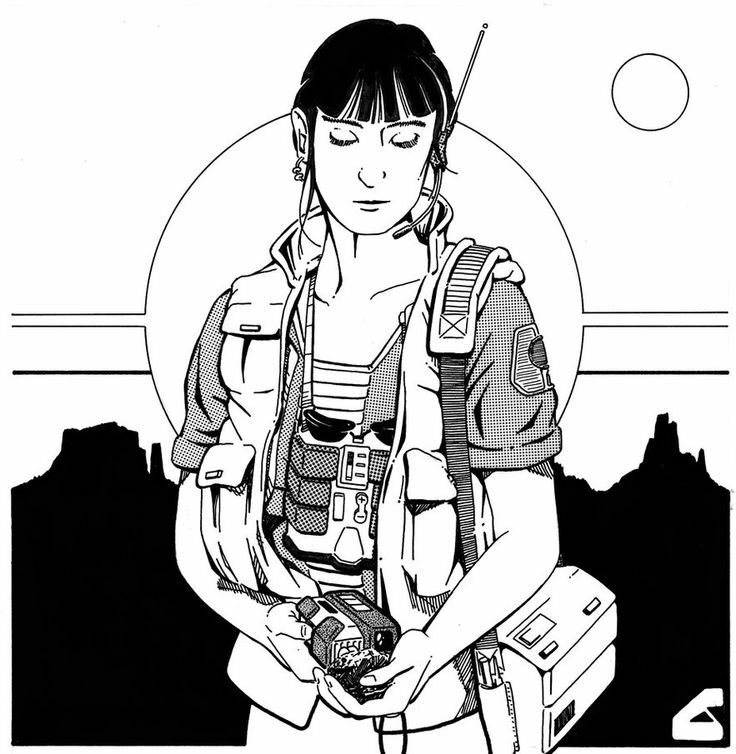 I’ve been fiddling around with my sci-fi Savage Worlds game getting everything together. Something I’ve been a stalwart supporter for over the years is using online tools as information repositories for current games. I tend to game pretty infrequently, just about every other week. So for long campaigns I need a place to keep track of major events that happen. Another plus is I don’t need to saddle my players with scribbling down the name of every major NPC they come across. The important stuff I can put on up the campaign site for reference later. Additionally we have about 2-3 different settings going on. I sometimes get a little burnt out GMing a particular setting and like to have an occasional one shot game once in a while. It can be a challenge for my players to keep track of the types of worlds they are playing in. Sometimes they need something to jog their memory on who the major movers and shakers are for that campaign. In these cases having an online wiki or blog is great keeping everything together. For a long while now I have been using Obsidian Portal for a few of my games. It’s a great tool but lately I’ve migrated towards having more simple sites. I’ve found I don’t usually need the complete functionality of a wiki. I can just keep a running page or two of major NPCs or locations. So currently I’ve been leaning towards using blogs instead. For my Savage Worlds superhero game it’s been a great means to provide a quick reference for major criminal (and neutral) organizations. Also by adding posts and tagging them, my players can filter out a lot of stuff and skim through past posts looking for specific enemies or topics related to the campaign. I haven’t been keeping a running adventure log going for that, but it could be done. With my sci-fi game I’ve found this especially helpful. Above all other settings I think players sometimes need a little more information on the game universe. 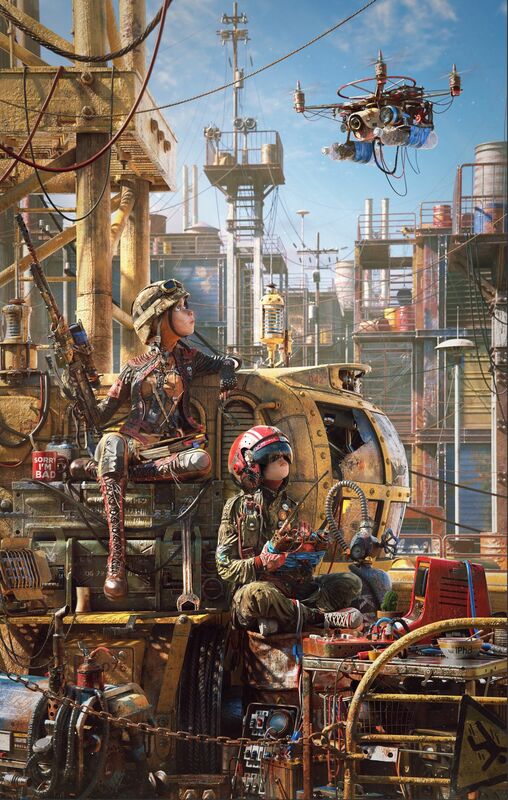 Sci-fi encompasses so many styles and themes, it can be difficult to accurately get across to players the levels of technology or how proliferate alien species are. Having a site that they can navigate to get that information is helpful. Mind you have to be realistic about how deep players will dig through your site. Some may enjoy it but expect many to be willing to skim through about a paragraph at most. So I try to keep things brief if possible, especially for adventure recaps. One last point though on having a campaign blog or wiki, it’s public. While it’s a way to share your world and ideas with others, it’ll also show how messy your games run including all the lackluster ideas. Just roll with it. Because sometimes you’ll have people mine your stuff for adventure ideas to use in their own games (Hee… or learn about things to avoid if scouring my campaigns). Honestly that alone is a great reason to have your campaign material up on a wiki or blog.